Even in December you can get fresh tomatoes as Grape and Cherry Tomatoes always seem to be available at our local markets. 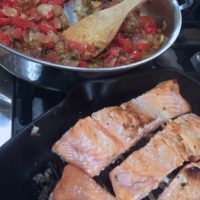 My children like Salmon but they really loved this best Salmon Recipe from no other than my favorite Barefoot Contessa. Since many of you can grill in the snow, this is the perfect recipe for salmon lovers. This salmon recipe is easy enough for the busy weeknight cook, but also glamorous enough for a dinner party. 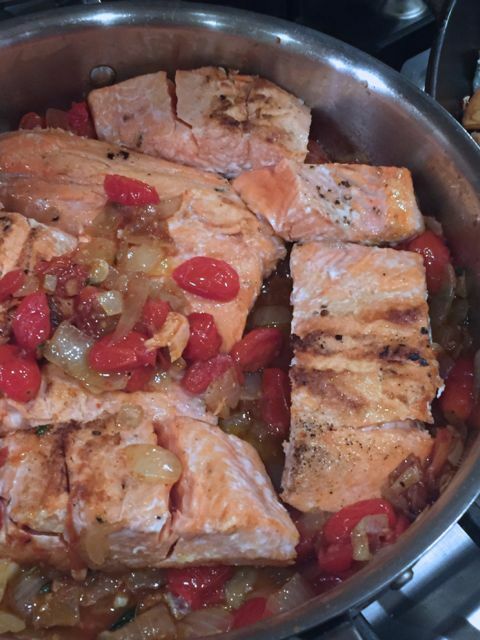 The whole family will love this Melting Tomatoes Ina Garten Salmon Recipe that comes together in just minutes. Grape tomatoes are available all year long so this is the perfect dinner to serve any month of the year. Like I mentioned before my family really enjoys fish and salmon recipes especially. We all agreed that you could probably switch out the fish to your family favorite as well. Enjoy this recipe year round as grape tomatoes are found at any market. I think this would be pretty with different colored tomatoes too. Buy whatever is in season and looks the freshest at your market. 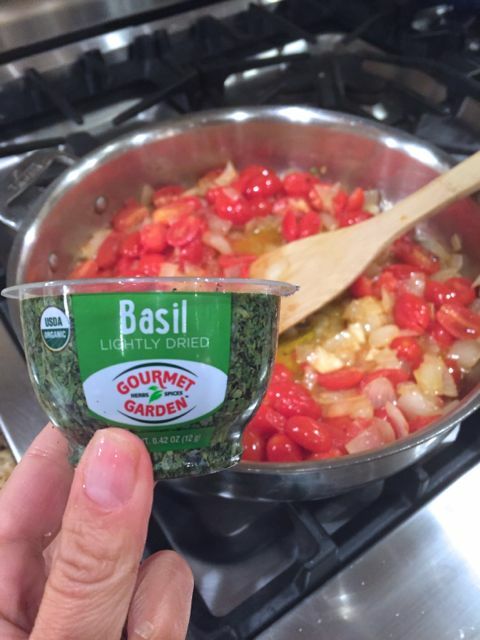 If you don’t have fresh herbs on hand be sure to try the Gourmet Gardens partially dried herbs. They last up to 3 weeks. 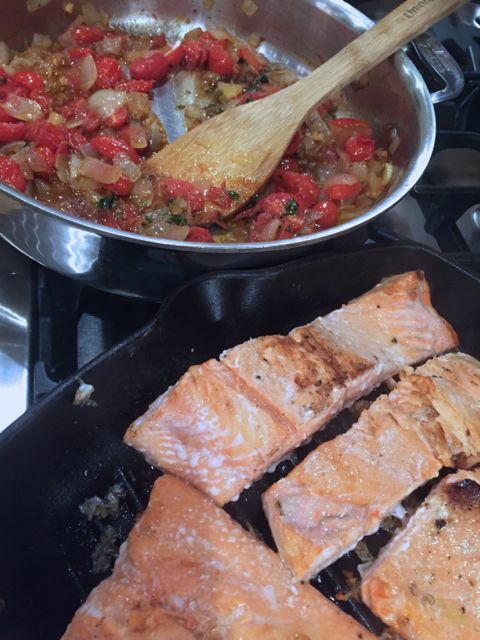 I grilled the salmon on the stovetop then added it to the tomato mixture. What a great way to enjoy the fresh caught Alaskan Salmon. I really love my le Creuset Grill pan for indoor grilling. Place salmon skin side up in the cast iron pan (or a heavy bottom fry pan) which I pre – heated for about 5 minutes. Cook the fish for about 4 minutes, don’t move them . Turn the salmon skin side down with a metal spatula . Transfer the pan to the oven for about 6 minutes. Remove the fish , make sure it’s cooked through, and place on a serving platter and cover with aluminum foil, allow to rest for at least 5 minutes. It will continue to cook for a bit after you remove it from pan. What is your best Salmon Recipe? 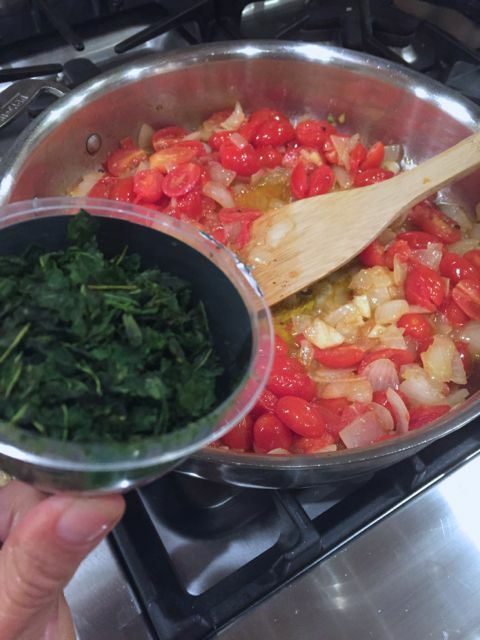 Since you don’t cook them together you can easily make his salmon and serve yours with the tomatoes. This looks delicious, and I’m thinking about serving it when we have company next week. Thanks for the post! This looks SO good – I love salmon! That has some of my favorite ingredients, looks delicious. Oh that looks really good and a different way to make salmon. Trying this the next time I buy salmon!